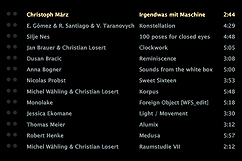 Robert Henke and his students of the master's program 'Sound Studies' at the Berlin University of the Arts (UdK). 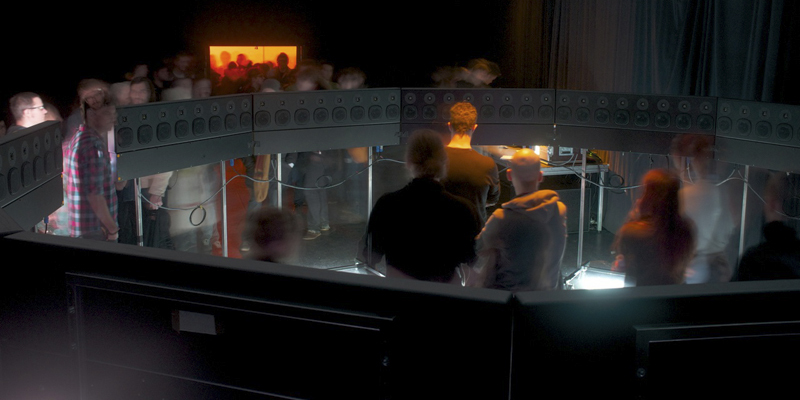 This project operates on the edge between technical and artistic exploration and focuses on the distribution of sound in space, utilizing a ring of 192 computer controlled loudspeakers, forming a 'wave field synthesis array'. 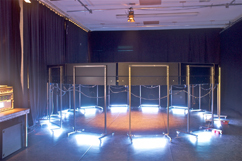 Wave field synthesis allows to place a huge number of virtual sound sources anywhere inside and outside that ring. Most spectacular is the effect of locating a sound source inside the head of a listener, an experience that cannot be achieved with other techniques. 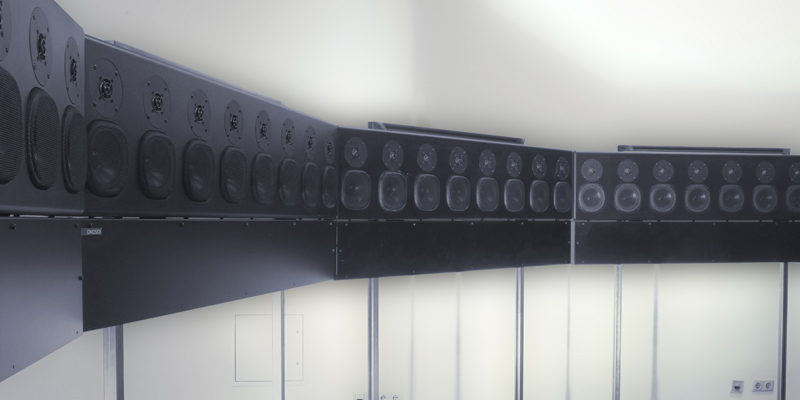 The large number of speakers is the equivalent to a large number of pixels in the visual world, enabling subtle and precise placements in space and a impossible depth of field. Wave field synthesis is a new technique that relies on powerful computers and on advanced algorithms for calculating the signals going to each speaker. Works for Wave Field Synthesis consists of two parts, the creation of a modular software framework and the creation of musical works that make use of the software. The framework allows to place and move sound sources dynamically with a a set of Max objects, and a Max4Live device. Those objects, developed by Robert Henke specifically for this project dramatically simplify the usage of the system and make it possible to achieve artistic results without too much technical overhead. The Max objects include algorithms for randomly spreading sources in a given area, to change the position of sources over time, to rotate, mirror or shift sources or groups of sources, to support distance dependent volume curves, Doppler effects, and much more. 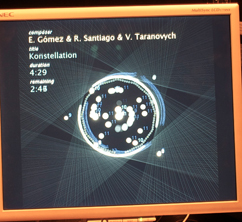 The framework also provides a highly customizable real time source position display including a direct video recording option and several 'user layers' that can be utilized for more audiovisual works, such as Robert Henke's 3. Algorithmische Studie für WFS . The pieces run as a continuous loop during the opening hours of the installation, and visitors are encouraged to walk around and explore the works from different locations. The compositions themselves are constructed in a way to support and encourage such a method of reception. The installation features eleven student pieces, plus a version of '3. Algorithmische Studie for WFS', entitled 'Medusa' and a special edit of Monolake's Foreign Object. Student works by Christoph März, Edgardo Gómez, Rafael Santiago, Volodomyr Taranovych, Silje Nes, Jan Brauer, Christian Losert, Dusan Bracic, Anna Bogner, Nicolas Probst, Michel Wähling, Jessica Ekomane and Thomas Maier. 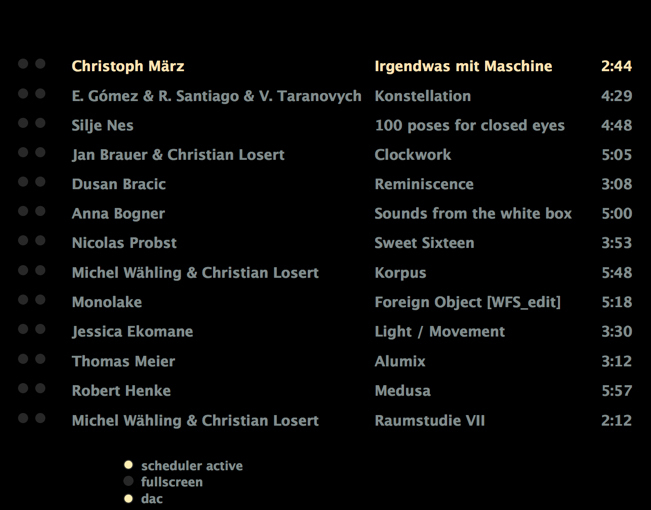 Works for Wave Field Synthesis got awarded with an Honorary Mention in the 'Digital Musics' category of Prix Ars Electronica 2013.